Yesterday my sister and I were driving back from a little road trip when I somehow lost my phone. We aren’t exactly sure where it was lost. We thought it had been lost in the car, but it wasn’t anywhere to be found in my sister’s car. At one point, the door was open and I am guessing my sister’s phone and mine were in the sidedoor pocket. We opened the door at one point, so my guess is it is laying in a snowbank somewhere along the side of the road. We walked the road for quite a while but it was below zero out and we never found it. My sister looked at me at one point and said, “If it was my phone, I would be more upset.” I looked at her and was like, “It is replaceable.” Yes, I am a little sad that I might lose some of my Christmas pictures. But my phone was backed up to the cloud, so I shouldn’t lose everything. I called Verizon this morning and am having a replacement phone overnighted to me. It’s amazing to me how connected to our phones we are and we don’t realize it until we don’t have it. My #oneword365 for 2014 was “Gentle.” As I sat in my sister’s car yesterday, I thought to myself I really have become more gentle with myself. A year ago I probably would have shed some tears and maybe even would have gotten pretty upset when I lost my phone. But yesterday I found myself in a much calmer and gentler state. I guess my #oneword365 had indeed made me a gentler person as I have lived into this word this year. I am thankful for the ways this word has shaped me this year. Thank you #oneword365 gentle! I can’t wait to see what my #oneword365 for 2015 is! During the 31 days, I met many new people through their blogs. One of the people I kept running into was Emily McFarlan Miller. Emily and I both chose “gentleness” as our OneWord365 for 2014. Emily asked me to write about what I had learned during the course of the year so I did. Today I am guest posting at Emily’s place. For as long as I can remember, I’ve been the hardest critic of myself! I’ve always been way harder on myself than gentle so that’s why I chose gentle as my oneword365 this year. Being gentle with ones self is an obstacle in and of its self! It is so difficult! But I’m finding myself attempting to be more gentle with myself! Recently I found myself trying to live this out—After some great girl talk, I mustarded up the courage to have a conversation with a dear friend than I needed to have. It was one of the most difficult conversations I’ve had in my life! But I needed to do it for myself! As the conversation unfolded, I definitely was feeling fear but I also wanted to do it for myself! I felt myself saying be gentle (with yourself) as we talked! I was surprised by the gentleness and peace that came over me after that conversation. I am finding there is something so holy about being gentle with ones self! In the midst of this gentleness I am reminded that Gods grace is sufficient!! Learning to be gentle with oneself is no easy task. I’ll admit that I am harder on myself than anyone else ever could be. Every day of 2014 I have tried to live into my #oneword 365 “gentle.” Some days I have been more successful than others. Part of being “gentle” with myself is trying not to focus so much on why certain things haven’t happened for me yet…like finding my Mr. Right and starting a family. I’ll admit that I think about these things more than I should. So I’m trying to learn to continue to be more “gentle” and not worry about these things. Yes, most days I have to listen deeply for that voice that says, “Be gentle, be gentle with yourself.” That gentle voice often gets muffled by the worlds distractions or my own thoughts. My prayer is that by living into this word I will be blessed! Anyone else notice how easily their #oneword365 slips into their head and heart? Sometimes my #oneword slips so easily in, that it takes me a minute to realize that it has snuck into my head and heart. 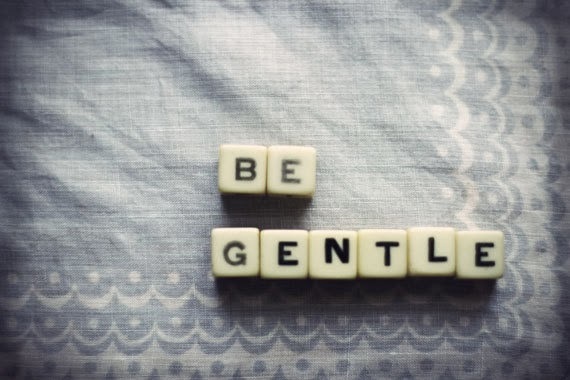 My word #gentle has been slipping in to my heart and brain so much lately. When I yearn for my Mr Right…I hear that voice saying, “Br gentle with yourself. Your time will come.” When I find myself feeling a little sense of loneliness as I continue to slowly make friends in this new place, I again hear that whisper of gentleness. That whisper of gentleness continually reminds me to be gentle…gentle with myself! This whisper of gentleness is what I believe I need to continue to grow into this year as I learn to be more gentle with myself! Yet that isn’t always so easy! May I continue to hear that whisper of gentleness and may I be gentle with myself! Have you ever been somewhere that made you realize that our actions aren’t always the gentlest for ourselves and the world around us? Today I was working out when I saw something that made me extremely sad. A young gal and her mother came in to workout. I am not sure how old or young this gal was but I don’t think she was comfortable being at this major workout place and especially since she would clearly be labeled as “overweight.” At one point, I looked over and was pretty sure I saw her eyes welling up with tears. I found myself trying to focus on my own workout and not focus on her. But at one point, I heard words that I cannot erase from my mind. One of the woman was on the floor doing a workout move when she simply said, “I have fallen and I cannot get up.” I know that those words weren’t supposed to mean anything but I could see how they cut to the core of this young gal. Oh how we need to be not just “gentle” with ourselves but with our actions and especially with each other. In so many ways, I saw myself in this young gal. Ever since I can remember I have been the overweight girl. I have found myself being picked last for the team in gym class. I have seen the looks from others that I am not as pretty as the other girl. I have seen the hurt in my own eyes as those mean words cut to my very core. And so I wish that I could say so many things to this young gal that was working out tonight. And if I could this is what I would say: Dear Child of God—You are beautiful. You have been “fearfully and wonderfully made.” I am proud of you for taking the time to workout with your mom. I am proud of you for even stepping foot in this building. I am proud of you for continuing to workout even as I saw the tears welling up in your eyes. I am proud of all that you can…and will accomplish. I know this isn’t an easy place to be. But please know that God is always with you. God promises to never leave you or forsake you. I used to be you. I used to be picked on and teased for so many reasons. And now I can look at those bullies and say to them, “Look at me now! Look at what I have accomplished.” You will always be a beloved child of God; always loved and cherished by God. Never forget that promise!—Love a sister in Christ. And as I write these words, I am reminded that we need to be “gentle” with our actions and the world around us. By being gentle, I believe the world will be a much more welcoming, peaceful and hopeful place. But I am finding myself just a little more aware of this word in my life. As I stated in my earlier blog post, most people would probably describe me as “gentle” but like I said I am definitely not always “gentle” with myself. That is often so much easier said than done. At 35 years old (and counting), I am and have been so ready to find my Mr. Right, to settle down, and to have a family. More often than I probably care to admit, I find myself reflecting on these things that I yearn sooo sooo deeply for in my life. And when I think about that, I realize those are some of the times when I am definitely harsh with myself and not at all gentle. I wonder why it hasn’t happened for me yet. Am I not pretty enough? Do I not have anything to offer? And so many more questions. I realize these are not unfamiliar questions but too often I find myself in the un-gentleness with myself asking these questions. So one of my hopes and prayers as I live into this word is to find myself being gentle with myself when I do ask these questions…because I know that I am going to ask them. Also in similar regards, I find myself being more “gentle” in regards to this here blog as well. I used to watch and wait to see who would comment on a post every time I wrote a post. For me, probably because of my own insecurities, I wondered if I truly had anything to say and if people were going to actually read it. But this first week of 2014 as I have lived into my word for the year, I find myself looking at my stats but not focusing so much on why people aren’t commented (Don’t get me wrong though I do LOVE receiving comments) or even if people are reading it. In being gentle with myself, hopefully I start to see a softness and a joy that this blog truly brings to my life. And that is exactly what I found myself doing…being more gentle. Thank you for walking with me as I learn to be more “gentle” with myself. Are you too living out a word this year? What is your word? How can I support you as you live out your #oneword365? “Nothing is so strong as gentleness, and nothing is so gentle as true strength.” When I came across this quote on my Pinterest feed, I knew that I had found my #oneword365 for 2014! I have never done the #oneword365 so I was a little nervous to what my word might be and if I would even hear it. But the other day I kept hearing this voice whispering to me the word “gentle.” And then I came across the quote I just posted…I knew that God had been whispering that word to me. So my #oneword365 for 2014 is the word GENTLE! I would say that most people who know me might describe me as gentle but the truth is that I am not gentle with myself. Ever since I can remember I have been pretty tough on myself. I don’t always see myself as the most beautiful. I need to remind myself to be gentle with myself. To be gentle when life isn’t turning out the way I want it to. Those of you who regularly read this blog know that I especially am not “gentle” with myself as I wait for my Mr. Right. I am so ready. Yet perhaps by being “gentle” with myself God will bring that lucky guy into my life. Max Ehrmann once wrote, “Be gentle with yourself. You are a child of the universe. No less than the trees and the stars. In the noisy confusion of life keep peace in your soul.” Yes, I need to be gentle with myself…to be gentle with who I am and who God has created me to be. And by being gentle, I believe God will bring more peace to my soul! I also feel that I need to fall into being gentle. To be gentle with my words and my actions. There are times when I am not always gentle with those who I love. Sometimes when momma calls and I get a little impatient, I find myself snapping back and then I get mad at myself for snapping at her. I need to remind myself to be gentle with her. And to be gentle with myself because like a good Lutheran, I am both saint and sinner. I am not perfect and will make mistakes! And perhaps as I fall into this word that God has whispered into my ear and my heart, I will find that strength as well. May your 2014 be full of gentleness as well.